The X Platform™ Sweepstakes Challenge! Welcome to the X Platform™ Sweepstakes Challenge. In this challenge, you will experience the ease and simplicity of building and deploying highly performant, highly available distributed applications. All you need for this challenge is a machine with at least 1GB of RAM. Use of an IDE is optional. This is simple challenge designed to expose developers to the ease and simplicity of building distributed applications. Depending on your level of experience with Github and Java, the challenge will take you between 30 minutes to 1 hour. But don’t worry, we are not timing you. You will be building your application for this challenge using the ‘Starter App’ described in the Talon Manual. The Talon Manual contains the link to request your free X Platform™ key and to download the starter app. Please be sure to use the same email address for the key generation and your sweepstakes entry submission - only one entry will be accepted per person. Complete the tutorial called Get Started. 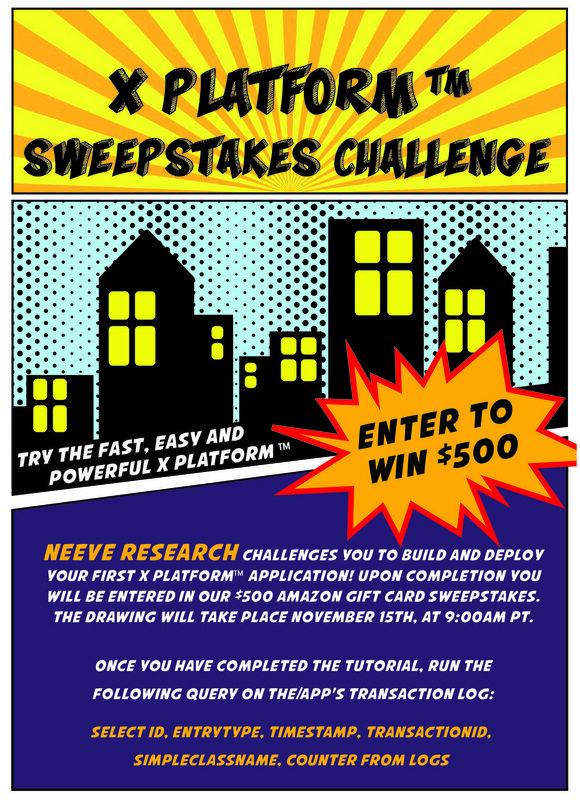 Send your name, email address (must be the one used to request the free key in the tutorial) and a screenshot of the query output (from Step 2) to challenge@neeveresearch.com with "X Platform Sweepstakes Challenge" as the email subject. Once your submission is received and verified, you will receive an email confirmation of your entry. For any questions or further assistance please contact us at challenge@neeveresearch.com.